On March 9, 1862, the USS Monitor, prototype of a new class of warships, fought the Confederate ironclad CSS Virginia (ex-USS Merrimack)at Hampton Roads, Virginia, after the Virginia had ravaged the Union fleet blockading the James River, sinking larger, seemingly more powerful wooden warships in a potent demonstration of the power of an armored, heavily-gunned, steam-powered warship. While a technical stalemate, the events at Hampton Roads changed naval warfare forever. Less than nine months later, the now-famous Monitor was under tow, heading south to Beaufort, North Carolina, when she sank in heavy seas, with substantial loss of life. In 1973, Monitor’s remains were located, and in 1974 investigation of the wreck began, under the auspices of the National Oceanic and Atmospheric Administration in partnership with the US Navy. This book is the story of this decision, the raising of the turret, and the subsequent management of the historic resource. Sidebars in the book flesh out details. Lavish illustrations complement the informative and highly readable account by the archaeologist who planned and directed the major expeditions that resulted in recovery of many of the Monitor’s most significant objects. A history of Mathews County traced through Post Offices. Begins the day Pearl Harbor was bombed. Lifestyles changed at home with our men, and then 18-year-old boys, leaving for overseas. Rationing, salvaging, blackouts and women working became the norm. The Germans missed no time in sinking our ships, bringing essentials. Survivor's stories bring horror. Love letters bring tears, as do stories of those who survived prison camps, and internment in places the Japanese seized. Diaries recorded events and conditions that one couldn't write in censored letters. Pictures released after the war tell more than words in love letters. Mary Lincoln's Flannel Pajamas are various STORIES about First Ladies between Martha & Mamie, centering on some items of their clothing, whether it is a gown, or a pair of shoes, a hat or piece jewelry. All stories are real stories, between 600-2000 words each; it is not a fiction. The clothing is either factual, actual or metaphorical. 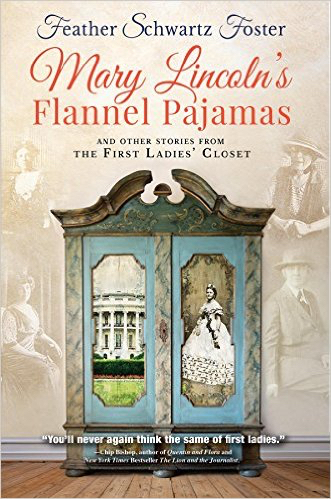 Mary Lincoln’s Flannel Pajamas and other Stories from the First Ladies’ Closet is available in trade paperback, hard cover and e-book. It can be ordered now at Amazon or Barnes & Noble. Brief snippets of the OLD First Ladies - Martha thru Mamie. Easy to read and understand. A perfect gift book. Click here to learn more about Feather Schwartz Foster and her books. Juan Patron lived through one of the bloodiest sagas of the American West: the 1878 feud known as the Lincoln County War in New Mexico. Known for his heroics, Patron strived to tame a frontier rife with violence, greed and illiteracy--first as a teacher, then an outlaw hunter and eventually speaker of the territorial house at age twenty-five, the youngest to take that seat in New Mexico history. The book leads us through Patron's turbulent life and his fate at the hands of a Texas cowboy who outdraws him in a dramatic showdown. Many believe that had he lived, Patron could have become New Mexico's first congressman when it joined the Union in 1912. Click here for Paul's website.